Subscribe to our free monthly Newsletter and never miss a post! National home-care company names top franchise offices for the year, honoring them for the impact they’ve made in their communities. DELRAY BEACH, FLA., Aug. 2, 2012—Fourteen home-care franchises from across the country received top honors at the first annual Preferred Care at Home convention and cruise. Offices from Florida to Alaska were awarded for the impact they’ve made in their communities. The convention was held July 11-16, starting in Delray Beach, Fla., for two days of meetings and ending with a three-day cruise. “These passionate owners showed continued growth and commitment to quality of life in their community,” says Frank Guerrieri, president and CEO of Preferred Care at Home. “We’re very selective when we bring in new owners, so rising to the top in this field is a hard-won and well-deserved accomplishment.” The states with honored offices are: Alabama, Alaska, Arizona, Florida, Michigan, Missouri and Tennessee. Suzanne Hickel of Anchorage, Alaska, gets many of her home-care clients through word-of-mouth. They helped propel her franchise to “Top Producer” for 2011. She also received the 4-Carat Diamond Presidential Award. Firefighter-paramedics Jason Groth, Mike Barnhard and Bob Mlynarek, in Macomb County, Mich., fought their way to Rookie of the Year for 2011. Of all the first-year offices, theirs saw the most significant growth. “We are proud and honored to serve the seniors of Macomb County,” says Mlynarek. The trio also received a Silver Presidential Award. The following awards were given for meeting mile markers for top production and service during 2011. Dave Nolting, St. Louis, Mo. Jason Groth, Mike Barnhard, Bob Mlynarek; Detroit, Mich.
Gina Bell, Oak Ridge, Tenn.
Mark and Stacy McQuade, Birmingham, Ala.
Sherman and Vicki Gipson, Scottsdale, Az. Deborah Langrock, Pinellas Cty, Fla.
John and Jennifer Robin, Knoxville, Tenn.
At Preferred Care at Home’s annual conference and cruise, other franchise owners learned how to make their home-care business thrive. To learn more about Preferred Care at Home’s top franchises or to talk with the owners directly, please call (561) 455-2627. Since 1984, the family-run home-care company Preferred Care at Home has been dedicated to providing reliable, compassionate and affordable home care. This care improves quality of life while safeguarding independence and dignity. Services include companionship, meal preparation, hygiene assistance, medication reminders, transportation and more. 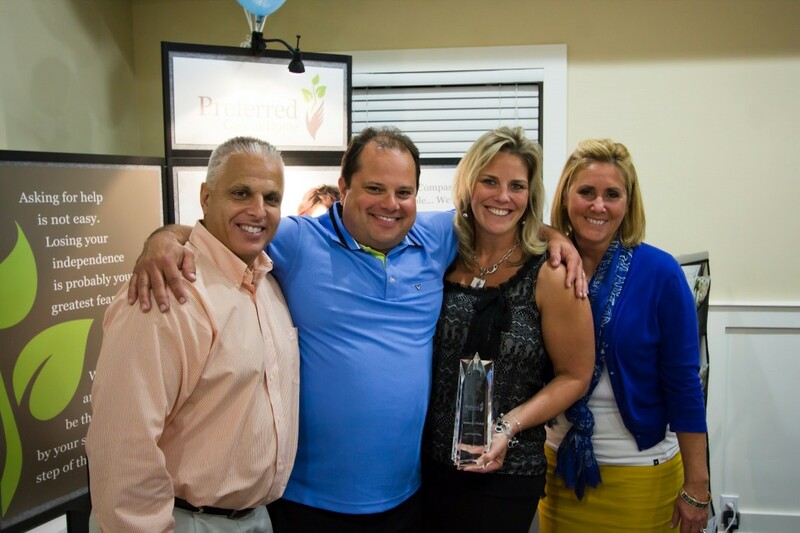 Preferred Care at Home is a nationally franchised company based in Delray Beach, Fla.